When we talk about Middle Eastern fare, dips, falafels and tagines inevitably come to mind. 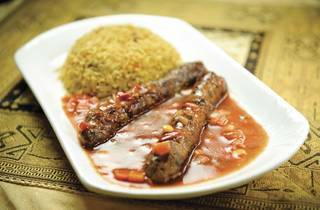 But Arabic restaurant Oh Food sheds new light on this underrated cuisine. Hidden inside a nondescript commercial building, this tiny 26-seater doesn’t regurgitate stereotypical Arabic cooking. Rather, it provides a more realistic reflection of the Middle East’s current culinary scene. At first glance, Oh Food doesn’t seem extrovertly Arabic. Aside from the beautifully embroidered tablecloths and shisha pipes (available from 6pm-8pm), there’s little other ornamentation that speaks of owner Omar Ayash’s native Syrian roots. Foodwise, don’t expect the restaurant to serve your standard mezzas. Even the chickpea hummus ($20) – the only dip on offer – is a distinctly Syrian rendition with a smoother, runnier consistency than most other ground chickpea pastes and is served with warmed, homemade loaves instead of the more common pita basket. It’s also worth mentioning that Oh Food offers several Chinese dishes during lunch on weekdays. The rest of the menu traverses between dishes that are indigenous to the Arab nation and ones that have steadily assimilated into its culture. For example, there’s the simple Arabic salad (a combination of diced tomatoes, cucumbers and lettuce tossed in olive oil, $20) but the restaurant also serves coleslaw and cream soups (both $20), as well as a selection of pastas ($40-$45). Similar treatment is afforded to the mains, which are all meat-heavy and come with a choice of Arabic rice, biryani or bread with French fries (these are supposed to be vastly popular in the Middle East). Everything is halal, prepared sans additives and flavoured using only natural herbs and spices. The roast chicken sheesh taook ($50) is blanketed under a white roux-like sauce that’s subtly piqued with cumin and tamarind. The white meat is delicious, soft and succulent without the least bit of gristle. The sauce is on the mild side but pairs especially well with a side of long grain rice perfumed with ghee and spices. 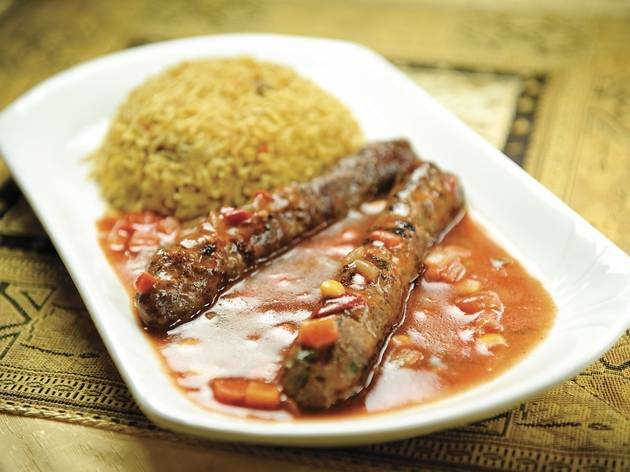 Beef kebabs in tomato sauce ($50) appear more like elongated kofta – minced meat patties seasoned with spices and shaped into fat cigars. It’s like a rolled hamburger, but much less greasy. Most of the mains are also available in sandwich form ($20-$25) with the meat and greens served in a crusty bun like an American sub. To end the meal, traditionalists can try the milk curd pudding ($15). The thick, creamy dessert wobbles ever-so-slightly under the weight of chopped pistachios. The nuts are imported from Syria and add a delicate floral taste to the whole affair. Alternatively, there’s an Arab-adapted apple pie ($20) on the menu. The sweet pastry is more like a fusion between cake and shortbread – a soft and intensely buttery base that’s smothered in custard before being heaped over with stewed apples, raisins and a crumbly streusel topping. 11/F, Southern Commercial Bldg, 11-13 Luard Rd, Wan Chai, 2529 3999. Daily 7am-3pm & 6pm-10pm.